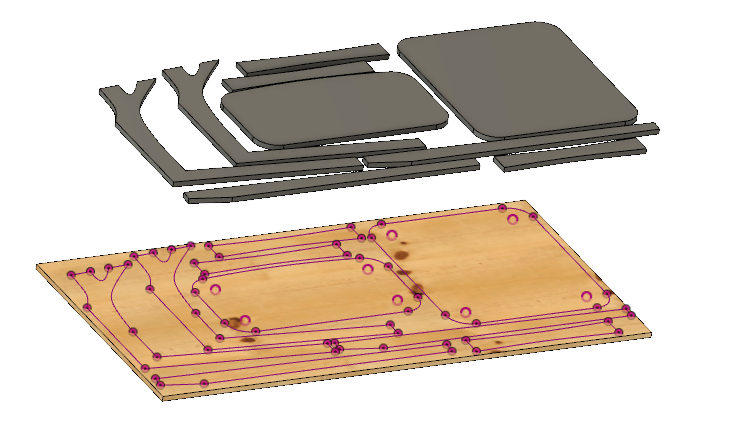 I’m a CAD advanced amateur: I first learned SolidWorks to laser cut tetrominoes, then I used Autodesk Inventor extensively to design and CNC mill my cell phone explore workshop designs, and generate construction plans for a sauna (writeup on that TBD). Overall, I’ve probably spent just a hundred hours using CAD packages, learning via Lynda.com video training courses and relentless clicking through menus. I was happy with Inventor, but unfortunately it’s Windows-only and while traveling I only have my Mac laptop. Since Fusion 360 does work on OS X (and because Autodesk is pushing it hard into the hobbyist market) I thought it’d be worth exploring. I first installed Fusion 360 via the Mac App Store, but this turned out to have OS X sandbox limitations that prevented plugins from fully accessing the filesystem. 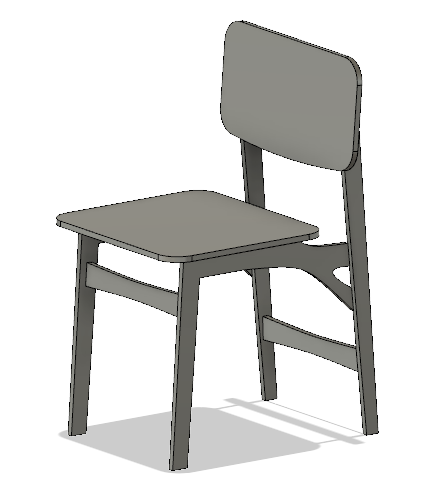 So I reinstalled Fusion 360 directly from Autodesk’s website (Version 2.0.5357) Apparently this includes a 30 day trial; no idea what will happen after that, but it’s good motivation to finish the chair I’m making. Sometimes Fusion 360 starts in 5 seconds; other times it literally takes a few minutes, with Activity Monitor reporting “Application Not Responding”. Have faith (or go make a coffee). 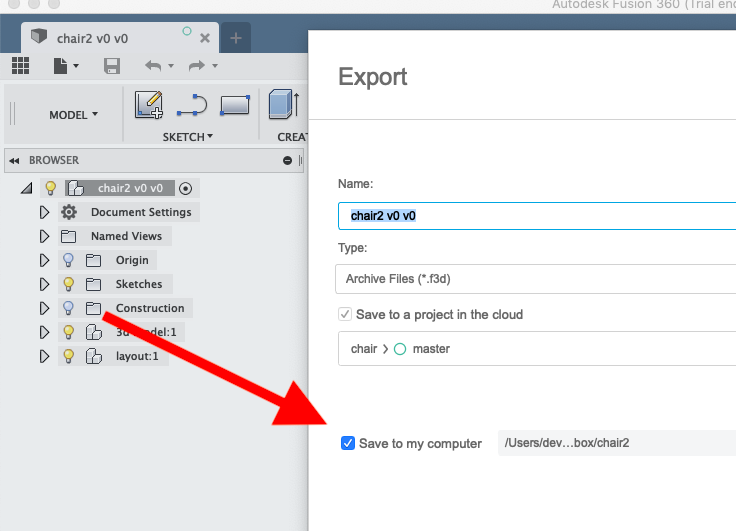 I told Fusion my project was “chair2” and it opened a tab called “chair2 v0”. That’s cool, sounds like there’s some built in versioning. Note: Craig Andera wrote in to clarify some of the issues I ran into below. You can check out our conversation for details. 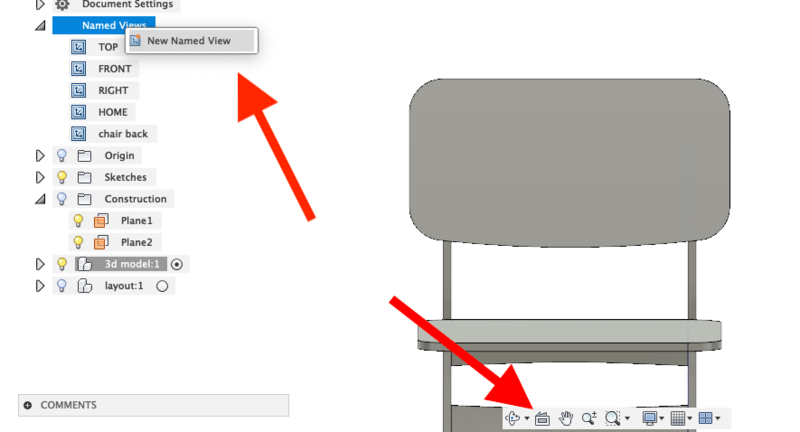 Unlike SolidWorks and Inventor’s “parts” and “assemblies”, Fusion just has “components” which can be nested within each other. This seems nice. 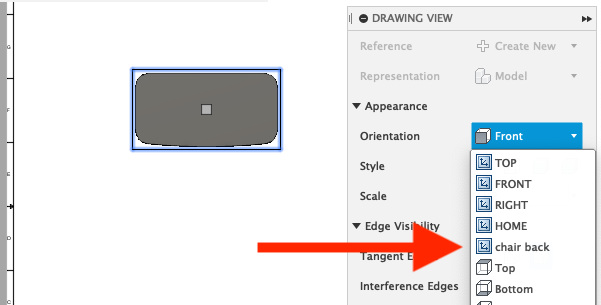 Parameters have to be defined in advance (Modify > Change Parameters); they cannot be created on the fly by dimensioning something as, e.g., width = 10cm This is infuriating, especially since there’s no way to leave the parameters window open while editing features/sketches. I’m not sure how to tell when sketch geometry is under-constrained (unlike Inventor, which helpfully draws constrained points/lines in purple and unconstrained in green). It wouldn’t surprise me if my chair has a few underconstrained bits, which makes it feel even more necessary to manually backup/version things, lest an accidental drag/drop mess something up. Never having used Fusion 360 before, this took me about 4 hours to model. 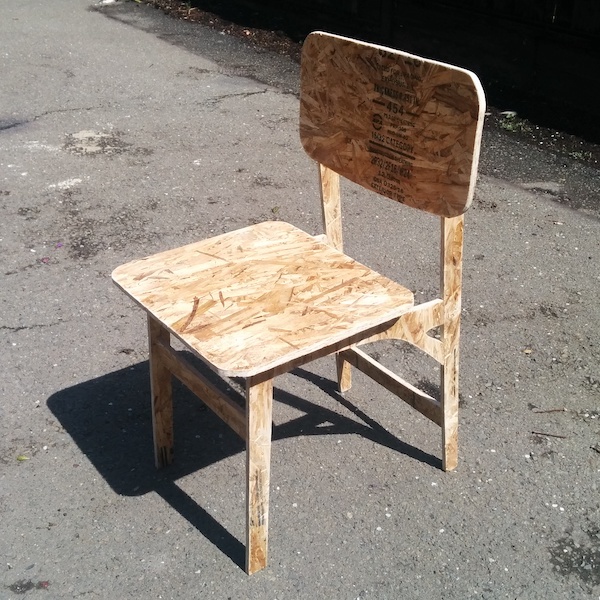 I planned to cut my chair from a sheet of plywood / OSB and assemble with dowels (flatpack-style). 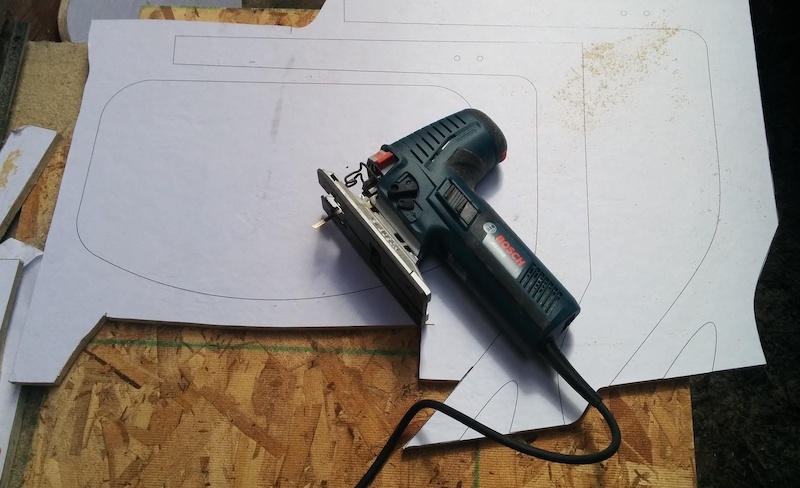 Initially, my plan was to create a sheet-sized PDF (4’ x 8’) from Fusion 360, then find some PDF utility to split across a home-printable paper size (i.e., 8.5" x 11"). It’s tedious to import individual components and position them within the drawing sheet. 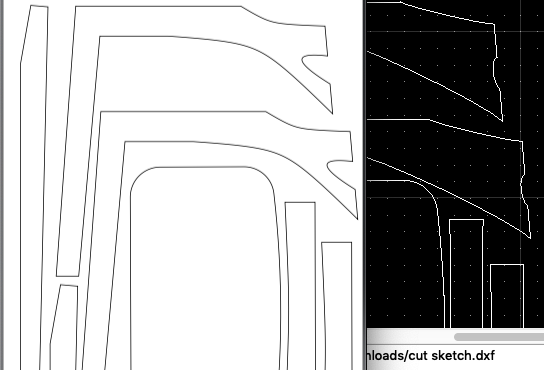 This makes it impossible to create 1:1 scale drawings for usage as templates; perhaps one could workaround by manually creating a scaled drawing and including a boundary sketch to match the desired sheet good aspect ratio, but at that point how much is the software really helping? To make the parts co-planar, I found the Modify > Align tool to be much faster than using the formal Assemble > Joint tool. See this video for details. https://www.dxfconverter.org/ made it square and added whitespace. https://www.zamzar.com/convert/dxf-to-pdf/ messed up the dimensions. LibreCAD: Exported blank PDF; I also couldn’t figure out how to center artwork and set final paper size. I then gave up on DXF export and instead turned to the Shaper Utilities plugin, which exports to SVG. Sketch doesn’t seem to process vector-effect="non-scaling-stroke", which together with the truncation gives a 2 cm line width. Finally, I decided to just process the SVG myself, since it’s a format I understand from years of working on the web. As someone who has built in the middle of the woods, I can’t justify paying for software that refuses to work offline. I’ve since switched back to my old copy of Inventor, which actually runs more smoothly in a Parallels VM than Fusion 360 ever did natively. Plus, since the VM has never seen the Internet and works fine, I know it’ll work just fine 10 years from now — which is more than I can say for Fusion.